Manganese Greensand® is capable of reducing iron, manganese and hydrogen sulfide from water through oxidation and filtration. 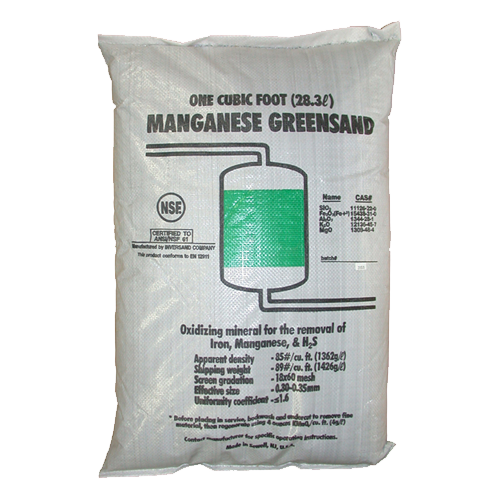 Manganese Greensand is formulated from a glauconite greensand which is capable of reducing iron, manganese and hydrogen sulfide from water through oxidation and filtration. Soluble iron and manganese are oxidized and precipitated by contact with higher oxides of manganese on the greensand granules. The hydrogen sulfide is reduced by oxidation to an insoluble sulfur precipitate. Precipitates are then filtered and removed by backwashing. When the oxidizing capacity power of the Manganese Greensand bed is exhausted, the bed has to be regenerated with a weak potassium permanganate (KMnO4) solution thus restoring the oxidizing capacity of the bed. 1.5 to 2 ounces of potassium permanganate, in solution, per cubic foot of Manganese Greensand is considered sufficient for normal regeneration. It is required to vigorously backwash and regenerate the bed when it is placed in service and before its oxidation capacity is totally exhausted. Operating the bed after oxidation capacity is exhausted will reduce its service life and may cause staining. Regeneration: 1.5-2 oz of KMnO4 by weight per cu. ft.
Backwash flow rate: 10-12 gpm/sq. ft.